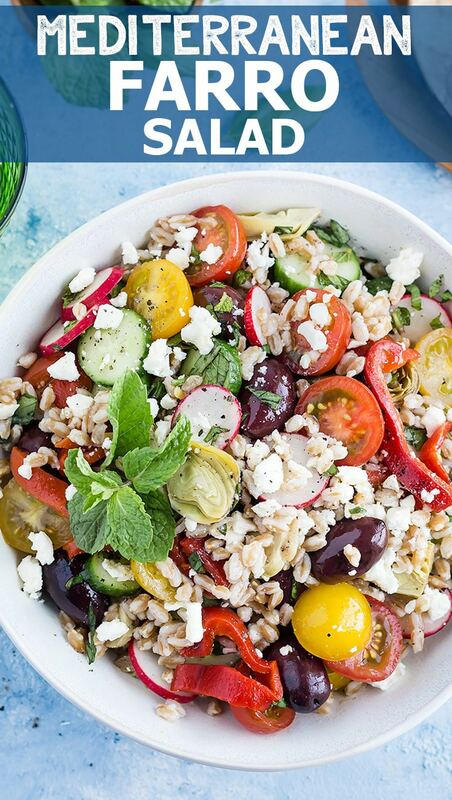 This Mediterranean Farro Salad is colorful, healthy and easy to prepare. It’s also anything but ordinary, made with a zesty mix of fresh and marinated vegetables, feta cheese, herbs, and a drizzle of homemade lemon vinaigrette. I love eating salads during the summer months. 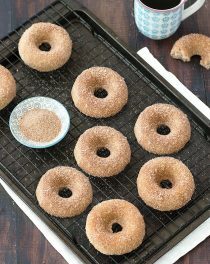 They’re refreshing, satisfying, and you don’t have to turn on the stove to make them! The only problem is that the same old mix of lettuce and vegetables can get a little boring. 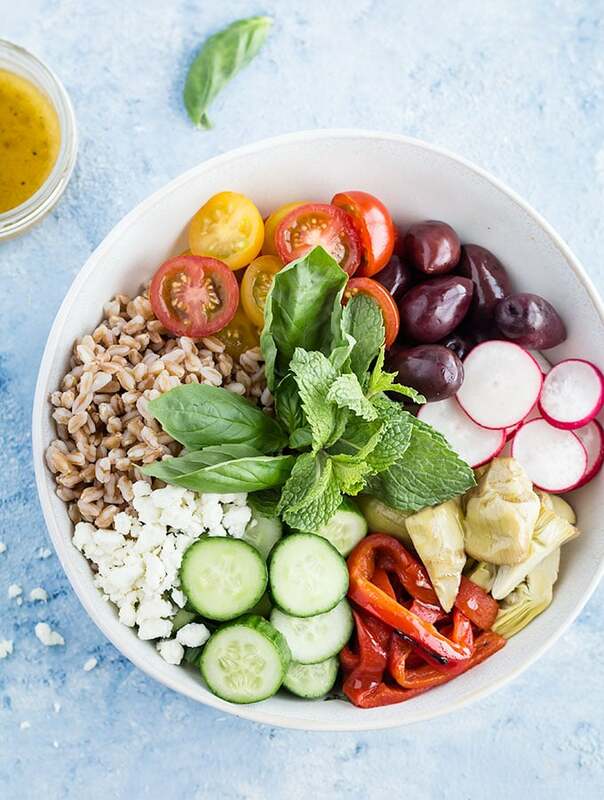 That’s why my current favorite is this mediterranean farro salad, a delicious vegetarian dish that’s packed with color, taste, texture, and nutrition. With its flavorful mix of ingredients, every bite is interesting. Hearty farro is blended with sweet cherry tomatoes, roasted red peppers, marinated artichokes, and crispy cucumbers and radishes. Next, Kalamata olives add a kick of boldness alongside a sprinkle of tangy feta cheese and a handful of fresh basil and mint. Last, everything is tossed in a homemade lemon vinaigrette, tying it all together. On a hot day, this simple meal can be whipped up in 30 minutes or so. It’s also a great recipe to serve as a side at cookouts and potlucks. 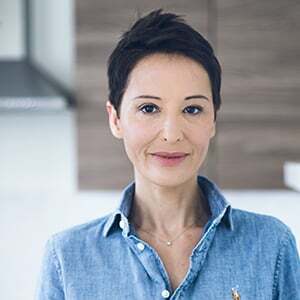 Whether I’m hosting or attending a get-together, I always try to make something healthy to bring to the table (I also like having options that can be altered for certain dietary restrictions.) This flavorful dish can be served as a first course at a big family dinner, but it’s also perfect on a paper plate next to grilled hamburgers, shrimp, or chicken. 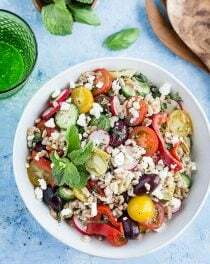 However, my favorite way to enjoy mediterranean farro salad is by itself, as a healthy lunch or light dinner. And because the base of the dish is farro rather than lettuce, it makes for great leftovers. (I would even argue that it tastes even better the next day, after all the components have had time to marinate.) In fact, it’s so easy to make a big batch at the beginning of the week and toss a few scoops in a tupperware to take to work for lunch! If you’ve never tried farro before, this is a great way to get acquainted with the ancient grain. 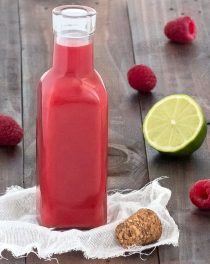 It has a mild, nutty flavor and a slightly chewy texture. It’s so satisfying, you may find yourself adding it to all your other salads! 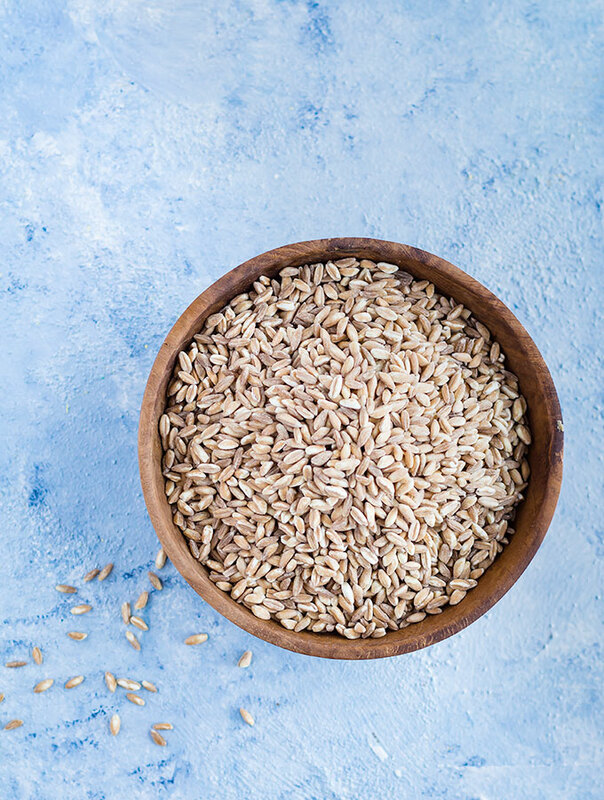 With that said, you can always swap farro out for barley, couscous, brown rice, or even quinoa if you can’t find it in the grocery store (or it’s just not your thing). To save time, you can use jarred roasted red peppers, but I usually prepare my own for a fresh, smoky taste. You may also choose to substitute feta for other cheeses, or leave it out completely in order to keep this recipe dairy-free and vegan. 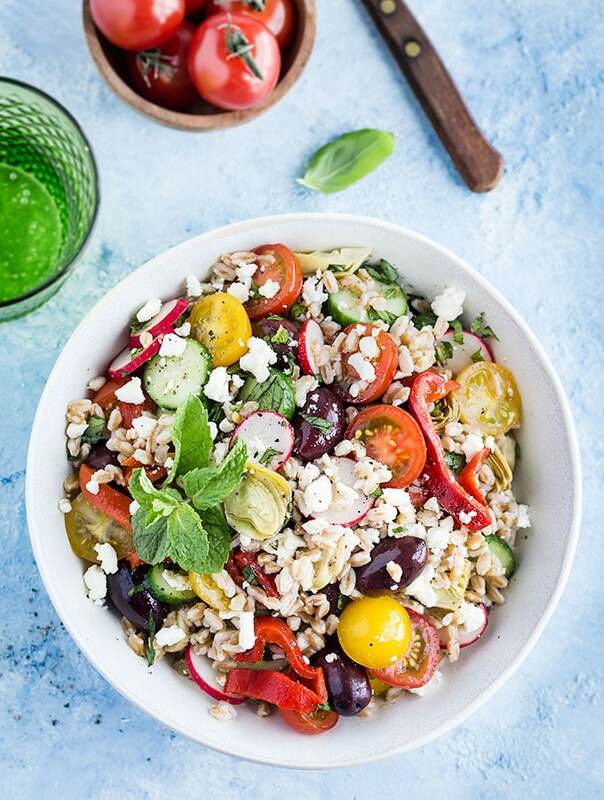 For your next cookout or on a balmy summer evening when it’s too hot to cook, prepare this mediterranean farro salad for a satiating dish that won’t leave you feeling heavy. You can try pairing it with pita or tortilla chips for a utensil-free meal, or just savor it by the spoonful! 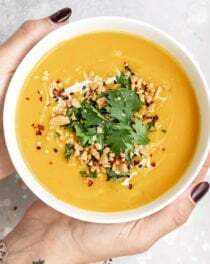 With its zesty flavors and textures and customizable options, you’ll find yourself making this versatile recipe all summer long. Give this Farro Salad a try and let me know what you think! Leave a comment, rate it, and don’t forget to tag a photo #aseasyasapplepie on Instagram. 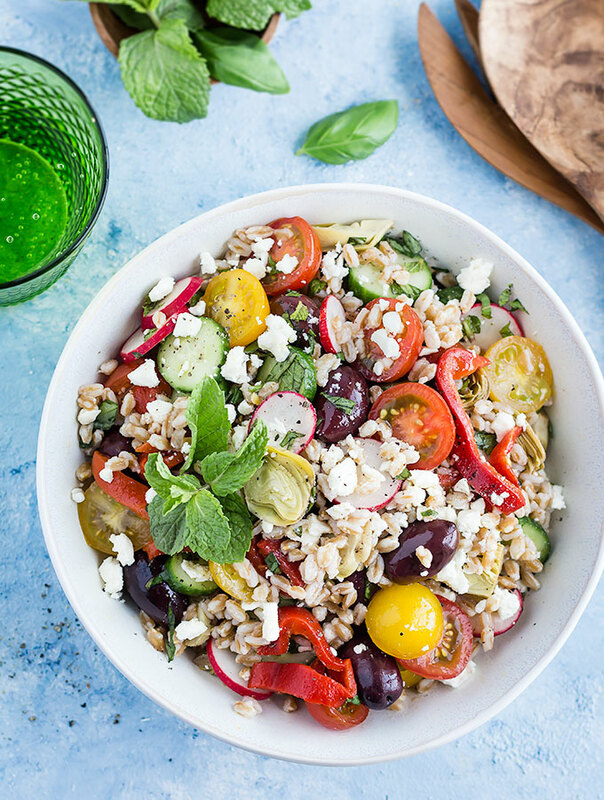 This Mediterranean Farro Salad is perfect for summer barbecues, picnics or as a light, healthy meal. Whisk all the ingredients together until combined. Cook the farro according to package directions. While the farro cooks, chop all your veggies. Transfer the farro to a large mixing bowl, and add the remaining ingredients, including the vinaigrette. Gently toss to combine. Serve immediately, or cover and refrigerate for up to 2 days.